Is Speaker John Boehner A Cultural Marxist? | Stop Obama Now!! 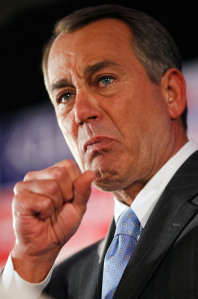 Is Speaker John Boehner A Cultural Marxist? to the Republican masses House Speaker, John Boehner, is traveling to San Diego this week to encourage openly-gay Republican candidates. Supporting a candidate and giving him preference because he is gay is a cultural-Marxist concept. The idea of cultural Marxism has permeated American society in recent decades and has spread Ebola-like to the Republican Party and even its leadership. If the spread of this ideological infection is not stopped soon, it will result in a very painful death of the Republican Party as the party of conservatives. 1 Response to Is Speaker John Boehner A Cultural Marxist?